For a limited time, my latest episode of Littlest Pet Shop can be found HERE. The Summary: "Bigfoot fanatic Roger Baxter buys a camper trailer and takes Blythe and the pets on a camping trip. 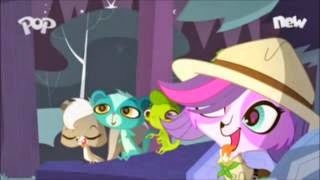 The pets question Penny Ling’s whereabouts while Blythe discovers the Biskit twins and their father are camped nearby and destroying the forest in Little BigFoot from Season 2 of Littlest Pet Shop."